Mifflin County’s Reed Earnest, right, rounds third and is congratulated by coach Tim Blystone after hitting a two-run home run in the top of the first inning of a semifinal game against Minooka Sunday at Rec Park. LEWISTOWN — In its first year since returning to Cal Ripken baseball, the Mifflin County Youth Baseball has learned to adjust to playing against new teams with different styles and pitchers. Rec Park in Lewistown had the honor of hosting one of two state playoff tournaments for 12-and-under teams that play on 60-foot base paths, giving Mifflin County the chance to go up against some strong talent from across the state. In a semifinal Sunday, the Mifflin County 12Us fell 25-3 to Minooka, a league based in Scranton. Minooka, the top seed in the four-team bracket, is the same one Mifflin County battled with in the first game. Things began on a positive note for the Mifflin County crew, which sported a two-run lead after the top of the first. With one out, Tyler Blystone singled into left field, setting the stage for Reed Earnest. Earnest was up for the challenge as he sent a screamer over the wall in right-center field, giving the Mifflin County offense a 2-0 advantage. However, playing with only nine players and having already played a game earlier in the day, Mifflin County’s defense and pitching became tired as Minooka broke open the game in the bottom of the inning, plating 13 runs. Minooka scored another 12 runs in the third to put the game out of reach, 25-2. Mifflin County was able to score another run in the top of the fourth as Aaden Earnest doubled and eventually scored, ending the scoring at 25-3. Earlier in the day, Mifflin County hung tough with North Pocono for much of the contest before dropping off late in a 17-2 loss. Day one proved to be a learning experience for the youngsters and the locals had a few good moments but finished 0-2. In the first contest, Mifflin County played Minooka to n 18-3 loss. Highlighting the first game for Mifflin County was Isaac Wilson, who blasted a two-run home run for his team’s only runs. In the second round-robin game, also Saturday, Brandywin assembled an 18-3 win over Mifflin County. Things started out promisingly for the locals as they were the visiting team and scored one in the first inning and then two in the second, taking a 3-1 advantage as the game went into the third inning. But being shorthanded compared to other teams, Brandywine was able to take the wind out of Mifflin County’s sail. Wilson once again went deep out of the park for his second two-run home run home run, creating the early spark for Mifflin County team. Cal Ripken divides teams differently than Little League by age, and because the number of leagues affiliated with Cal Ripken — which is part of the same organization as Babe Ruth baseball — there are no district or section tournaments prior to states. Mifflin County Youth Baseball also fields all-star teams at the 11U, 10U, 9U and 8U level. 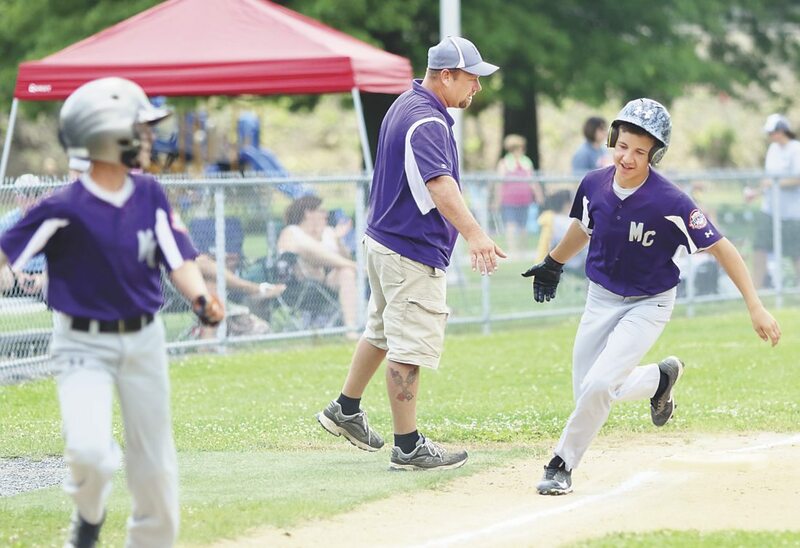 There are two formats for 12U players; Mifflin County plays on the traditional field size, while other leagues use a slightly larger field (70-foot base paths; 50 feet from home plate to the pitcher’s mound). Also in action over the weekend was the 10U team from Mifflin County which ended its tournament with a 2-2 record. On the opening day, Mifflin County edged Lehigh Valleu 9-7 after dropping a close 7-5 game to Brandywine, which was called for time. A 9-2 loss to Upper Merion sent the locals to the consolation game, which they win 16-4 over Minooka.